Walking out of church last night in the dark, and into the dark, the silence was comforting; I believe it was Barbara Brown Taylor who I first heard say that many folk prefer the solemn grief of Good Friday more than the triumphant joy of Easter. There is something about Christ’s solidarity with our grief, with our being betrayed, with our sorrows and sadnesses, and something about facing our sin and regrets, that is strangely good. hope, and in need of the redemptive power of the Lamb who was slain. Here are a few more books we recommend if you, too, want to be clearer about the teachings on the cross, and if you want to join the on-going conversation about new and old formulations about this core aspect to Christian faith and discipleship. I hope every so many years you take up a book or two like this, studying and knowing the deepest things about the deepest truth. The Cross of Christ John Stott (IVP) $26.00 I am always tickled to tell the story of how some liberal mainline pastors saw, in The New York Times, while staying at a hotel where I was selling books at their gathering complimentary story written by David Brooks on moderate, evangelical Anglican writer John Stott. They came to me asking if I had heard of this “Stoot” guy that Brooks was raving about. Of course I had a selection of his stuff on the book display; we take something of his nearly every book table we do. It is a sad statement about our churches that folks do not know this thoughtful, gentle, balanced, faithful writer of dozens of helpful books. (His Basic Christianity is now in a 50th anniversary edition and has sold millions.) Many pastors and thoughtful laypeople have said that this book on the cross is the best they’ve read on the subject, and is considered among thoughtful evangelicals to be a classic, and certainly the highpoint of Stott’s prodigious output. Fifty Reasons Why Jesus Came to Die John Piper (Crossway) I love this little book of one or two page Bible meditations, each on a different thing that the texts tells us are why Jesus died. Piper is a very conservative Reformed Baptist, so you can be sure he takes the standard texts about our justification by God’s grace at face value. He is also an honest Bible guy, so he happily notes diverse motivations and outcomes—-we become reconciled, we can break down walls of hostility, we can give our wealth away, we can become peacemakers, agents of reconciliation, and the like, all things specifically named in the Scriptures when they talk about the results of the work of the cross. Yes, this is a standard devotional of classic texts and I cannot imagine anyone who loves the Bible or the life of Jesus not being “strangely warmed” by these wondrous texts. Here is a great deal: we have these reflections also on audio, a lovely unabridged book-on-CD by ChristianAudio on sale for $5.98. What a great resource, even to give away or loan out. It is about 3 1/2 hours, read by Robertson Dean. The Atonement Debate edited by Derek Tidball and others (Zondervan) $18.99 A few years many evangelicals spilled much ink sometimes even mis-quoting Steve Chalke when he said that typical views of penal substitution could be seen by some as “cosmic child abuse” and that we have to be careful how we talk about this essential matter. Of course, he is fully right, it could be, and has been, seen as that. That begs the question of what Chalke thinks, and what the Bible and our best theologians say; he is surely correct, though, that we must be careful how we communicate the good news and the scandal—“foolishness” as Corinthians puts it–of the cross. This good book is a collection of papers that were convened around Chalke’s views, organized by the Evangelical Alliance and the London School of Theology. Contributions are included by Chalke, Chris Wright, I. Howard Marshall, Joel Green and many others. It is a superb compilation of various sub-topics, with sections about history, exegesis of key passages, engaging contemporary thinkers, and pastoral suggestions. Very strong. Stricken By God? Nonviolent Identification and the Victory of Christ Edited by Brad Jersak and Michael Hardin (Eerdmans) $32.00 I have not waded through all of this yet, but it is the best collection of serious essays representing this new view. Endorsements include Stanley Hauerwas, Greg Boyd, and Rene Girard (obviously a very important figure in the movement rejecting scapegoat theories and “redemptive violence.”) Here is a phrase or two that captures the question: Did God really pour out his wrath against sins on his Son to satisfy his own need for justice? Or did God-in-Christ forgive the world even as it unleashed its wrath against him? Was Christ’s sacrifice the ultimate fulfillment of God’s demand for redemptive bloodshed? Or was the cross God’s great “no” to that whole system? This distinctively panoramic volume offers fresh perspectives on these and other difficult questions emerging throughout church history. Authors include James Alison, Marcus Borg, C.F. D Moule, Richard Rohr, Miroslav Volf, J. Denny Weaver, Rowan Williams, N.T. Wright, Kharalambos Anstall, Sharon Baker and more. “remixes biblical metaphors, integrates doctrine and praxis, and deconstructs one-sided theories of the saving significance of the cross.” It is wise to place atonement theology within the context of God’s redemptive work in the world. Hint for those who may care: McKnight’s wholistic approach seems to have much in common with the patristic model of recapitulation. Saved From Sacrifice: A Theology of the Cross Mark Heim (Eerdmans) $26.00 Oh my, what a great example of mature thinking, careful new ideas, a deep care for Christian truths and a contemporary sensibility that doctrine must be alive for postmodern people. Rooted in the very best scholarship about nonviolent theorist Rene Girard (and his scapegoating theories), this is as warm and caring as an academic book can be. Highly recommended for those wanting new formulations that are interesting, beautifully conceived, and well-argued. Triune Atonement: Christ’s Healing for Sinners, Victims, and the Whole of Creation Andrew Sung Park (WJK) $19.95 Well, this book deserves a long and serious review from someone more knowledgeble than I. I have appreciated Dr. Park’s previous works where he takes the Asian concept of han and uses it to help us gain a more multi-faceted (and, he thinks, truly Biblical) understanding of sin. Han includes sin and sinned-againstness. It includes moral complicity and broken fallenness. Here, he appropriates this multi-faceted view of sin and shows that Christ’s atoning work is for, well, everything! In good teacherly fashion he explains most of the standard views throughout church history, and then offers his own peculiar mix, drawing on and holding up the work of the Holy Spirit, especially. (I am not sure of this, but I recall that this was a theme of a major World Council of Churches event a few years back—the Spirit’s work in the redemption of creation–and is a historic emphasis of the Orthdox.) Dr. Park is very aware of not only the early, medieval, Reformation church views, but is in dialogue with the wildest new thinkers, too, making this a useful guide to the topic. This question of how the very Trinity is involved in redemptive work is a fascinating one, and I applaud this book for raising such matters. Sadly, it is poorly written, with some sentences being terribly perplexing; when a tone of grace was called for it was wooden. (Perhaps this is owing to a language barrier if English is not Park’s native language.) I suspect he wants it to be used as a textbook, so he makes academic allusions to scholars and books that typical readers may not appreciate. (How many readers know what a “womanist” theologian is? How many will follow his brief argument that they could be two Holy Spirits, the Spirit of Jesus and the Paraclete, who are actually one? Can it be taken for granted that folk know James Cone or Chad Meyers whose names he drops in passing?) Dr. Park offers what is helpful about each approach, and some fair critique of each of the major views written about throughout church history, but the criticisms are too often terse and unqualified. (“This is wrong…” he simply says, as if it is a foregone conclusion that it is as wrong as he says in one short sentence. I wanted to shout “come on, brother, that isn’t fair!” Why a prominent denominational publisher would let this important work get published without adequate editing is beyond me. Another beef: the great last chapter on God’s redemptive work over all creation feels tacked on; consistent, but disconnected. (He says in the forward that it is an intregal part of the book, but it doesn’t appear until the end.) His case makes sense, but he doesn’t tie it into the flow of the book. While he shows that God’s healing hope for animals and Earth is taught in the Biblical text, he doesn’t do what he should have in a book on this topic: ask how the Triune atonement works to reconcile creation. Did Jesus’ shed blood have any effecicy for animals? Why or why not? It is a great, great question, and a good chapter (as far as it goes) but it wasn’t adequate in a book about the meaning of the cross. So, the new Triune Atonement is fascinating, saying some good stuff, bringing together various schools of thought, and extending them from our Triune God into all of creation. I just wish it were more careful, more clear, more willing to use a tentative tone when asserting grand ideas. Yet, at the end of the day, I appreciated his efforts and commend the book for those wanting an interesting example of new formulations by this Korean-American scholar. The Great Exchange: My Sin for His Righteousness Jerry Bridges & Bob Bevington (Crossway) $15.99 Do you want gospel transformation? Do you want to know how all this theology of the atonement and understanding justification by grace impacts our lives? Are you yawning with a “so what” about this post about theology books? 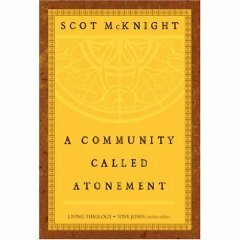 This is an excellent study of how the apostles taught about the atonement as the basis for faith living and makes the historic views of penal substitution very understandable. There is a classic Scottish work from 1870 called The Apostles’ Doctrine of the Atonement by George Smeaton. Most of us won’t pick that up, but this book is clearly patterned after it. Make time to read this and learn how the cross is not just for obtaining forgiveness, but is the power for Christian living, day-by-day. r is a Christian law professor and former federal prosecutor (and expert on sentencing guidelines whose work has been cited in the Supreme Court.) In each chapter he explains details about the trial of Jesus and uses that as a springboard into stories of injustice and legal corruption and the horrors of death row. Not a study of the atonement, but a close reading of the trial and passion narratives as a guide into discussion about the ethics of modern crime and punishment. Troubling, informative, and a new way to read the Bible in contemporary context. How Deep the Father’s Love for Us as done by Ferdnando Ortega. This entry was posted in BookNotes, Reviews by Byron Borger. Bookmark the permalink. What do these other theories posit as the reason that Jesus came and died? There seems no purpose for Him to come unless it was to die for our sin. This blog was interesting to read. I think there are many ways to interpret the various texts in the bible. That is the thing about literature, it can always be read many different ways, and people can come to many different interpretations, even if it is inspired by God. I personally like Madaline L’ Engle’s reflections on atonement in her book, “Stone for a Pillow.” Madaline also did not believe in the “cosmic child abuse” view of Christ’s death on the cross. I love her point that if you break the word atonement down it actually says “at-one-ment.” She makes the point that the atonement should not be viewed in terms of a legal proceeding where guilt is established and the guilty punished; the atonement is the idea that God is redeeming all of creation back to himself….he is making all things At-one with himself and his love. It is not about punishment in a legal sense, it is about love. One thing I don’t understand is the calvinist view of salvation and atonement. I personally feel that it is very pessimestic and frightening. Here is something I posted in a note on my facebook site that expresses some of my confusion about the Calvinist perspective. I am not going to post the whole thing here, but you can check it out if you’d like Byron….I just tagged you in the note in case you ae interested in reading it. Hi Matt, I would like to read your thoughts. Perhaps you could copy and paste them here. I am on Facebook, but I cannot read it unless you chose the option “everyone can read this” when you published the note.